1) I usually get groceries on Monday, but somehow my day got away from me and I didn't get it done. Tuesday morning we were so low on food in the house that for breakfast Drama Queen went to Breakfast Club at church, Ladies Man made himself a massive turkey sandwich and Miss Innocent One ate bean dip and tortilla chips. When I commented to the kids that this was yet another reason I won't be voted Mother of the Year, Ladies Man said, "You'll always be Mother of the Year in my heart, Mom, and in my liver and my lungs . . ." Somehow that erases all the sentiment, doesn't it? 2) Miss Innocent One is known in our house as slightly scatter brained. She made a goofy comment in the van the other day and Ladies Man romped on it. Ladies Man: And you say you're not a blond? Miss Innocent One: I'm not a blond . . . well, 50% of the time. I'm only a blond at home. Miss Innocent One: I can be a blond at home, but if I did that at school, kids would never let me forget it. Frankly I think Drama Queen and Ladies Man are pretty tough critics, but they must not have traumatized her too much yet. Whew. 3) Miss Innocent One, Ladies Man and I were in Lincoln and drove right by Drummer Boy's apartment. Seeing his car there, Miss Innocent One asked if we could stop. So I called Drummer Boy to let us in the front door. Me: Hey, we're sitting outside your apartment. Care if we stop in to say hello? Drummer Boy: I don't care, but it's a mess. I relayed the information to the other two. Miss Innocent One: Hello? Like we've never seen his room? We went on up and talked a little, then decided to take Drummer Boy out for dinner. (It was my only way to know he'd really eaten, you see, and this is what I live for--feeding my chicks.) While Drummer Boy got his shoes, Ladies Man snooped around his kitchen. Ladies Man: Mom, I'm kinda scared to be in college. He pointed to the pantry which held about three items, then gritted his teeth. No worries about grades or scholarships or tough professors for this guy. He's all about the food. 4) Whenever Kevin or I go up to watch Drummer Boy's drum line warm ups and rehearsals before Husker games, Drummer Boy always asks, "Is Drama Queen coming?" She hasn't been able to come with us all year, but finally got to see him do his thing last Saturday. I think he was glad to see her. What do you think? He's convinced her to join him at the University of Nebraska next year and try out for the snare line too. Wouldn't it be cool to see them BOTH playing there?! Drama Queen practices her fool head off. She'll give it her best. They'd have a blast. And this mama would be busting! 5) Does anyone have any magic way to teach children how to change a toilet paper roll? Apparently all four of my children are completely clueless. I've done it right before their very eyes more times than I can count, yet no matter which bathroom I choose to visit in our home, there sits an empty cardboard tube on the dispenser and a partially used roll on the back of the toilet. Maybe I should have asked to use Drummer Boy's bathroom and see if he's acquired the skill now that he has his own place. I don't have high hopes though. He specifically asked not to have a bed frame for his bed, setting his mattress and box springs right on the floor, so he wouldn't have to clean under a bed. This is the same guy who doesn't want a dresser because his clothes don't make it inside anyway. See? More reasons I'll never attain Mother of the Year. Oy! 6) Ladies Man came downstairs dressed for school in shorts and a t-shirt. Me: It's a high of 38 degrees today. Ladies Man: I'll be inside all day. Chill out, Mom. . . Get it? Oh brother. He also offered this little tidbit of information. Ladies Man: I hope I get taller because I want to be more intimidating. Me: Don't you think you already are? Ladies Man: I need to be more intimidating to guys who want to hang out with Drama Queen and Miss Innocent One. Me: You're keeping an eye on 'em, huh? Ladies Man: Whenever sketchy guys try to talk to Drama Queen, I stand right there by them. Me: Are you gonna look out for Miss Innocent One like that when she gets to high school? Ladies Man: Mom, I already do. Why do you think I want to meet that kid who talks to her in band all the time? Now isn't that sweet? Who says chivalry is dead? 7) Hey, all you southeast Nebraska friends need to listen to KUCV-FM (91.1) again this morning between 9 and 10. Kevin and I are promoting our upcoming Christmas musical on "Live at the Mill." At the very least, tune in and make fun of us behind our backs--whatever it takes to get you to listen! 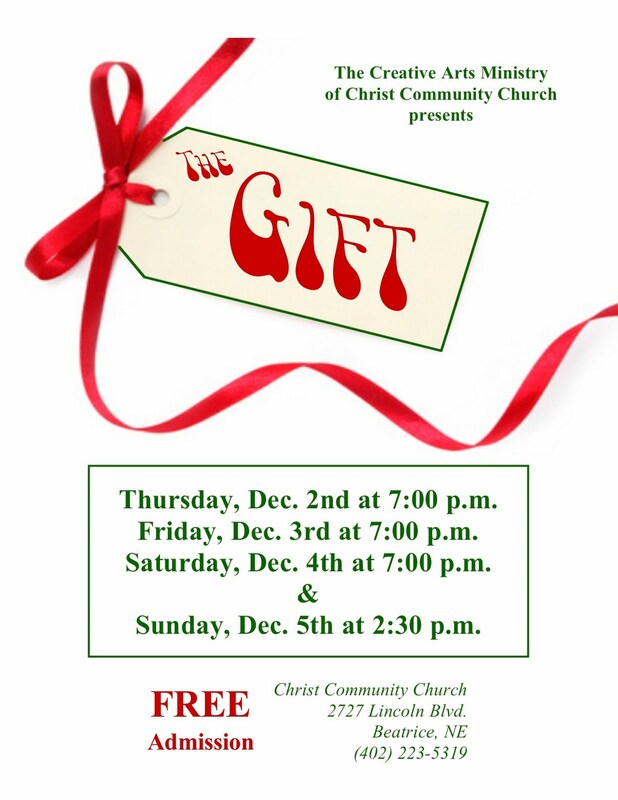 Better yet, just come to the production! Yes, you can expect shameless promotions for the next two weeks. I can't help it. I'd love to see your smiling faces there. 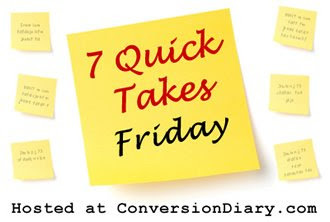 Have a great weekend, friends and enjoy more Quick Takes at Conversion Diary. I enjoy reading your accounts of life with your family. I raised a drummer, so I can relate. Sadly, he now lives abroad, playing music professionally - but I only get to see him every year or two...or more. So enjoy these days while you can. Fun post! Thanks - Marsha Y.